In this study, nitrogen and phosphorus removal from municipal wastewater in moving bed biofilm reactor operated as sequencing batch was investigated. Kaldnes (K1) material as biofilm carrier media was used in the study. Operation consisted of anaerobic/aerobic/anoxic/aerobic phases with hydraulic residence times of 120 min/330 min/210 min/50 min. In the moving bed biofilm reactor with the filling ratio of 50% operated as sequencing batch, average effluent chemical oxygen demand (COD), ammonium-nitrogen (NH4-N), nitrite-nitrogen (NO2-N), nitrate-nitrogen (NO3-N) and phosphate-phosphorus (PO4-P) values after the cycle duration of 12 h were determined to be 27 mg/L, 0.7 mg/L, 0.04 mg/L, 0.6 mg/L and 0.7 mg/L, respectively. The average COD, NH4-N and PO4-P removal efficiencies were obtained as 92%, 97.5% and 91.3%, respectively. B. L. Nogueira, J. Pérez, M. C. M. van Loosdrecht, A. R. Secchi, M. Dezotti, and E. C. Biscaia Jr., “Determination of the external mass transfer coefficient and influence of mixing intensity in moving bed biofilm reactors for wastewater treatment,” Water Research, vol. 80, 90-98, 2015. J. P. Bassin, B. Abbas, C. L. S. Vilela, R. Kleerebezem, G. Muyzer, A. S. Rosado, M. C. M. van Loosdrecht, and M. Dezotti, “Tracking the dynamics of heterotrophs and nitrifiers in moving-bed biofilm reactors operated at different COD/N ratios,” Bioresource Technology, vol. 192, 131-141, 2015. J. C. Leyva-Díaz, J. Martín-Pascual, M. M. Mu˜nío, J. González-López, E. Hontoriaa, and J. M. Poyatos, “Comparative kinetics of hybrid and pure moving bed reactor-membrane bioreactors,” Ecological Engineering, vol. 70, pp. 227-234, 2014. Y. Zhu, Y. Zhang, H.-Q. Ren, J.-J. Geng, K. Xu, H. Huang, and L.-L. Ding, “Physicochemical characteristics and microbial community evolution of biofilms during the start-up period in a moving bed biofilm reactor,” Bioresource Technology, vol. 180, 345-351, 2015. L. Chu, J. Wang, F. Quan, X.-H. Xing, L. Tang, and C. Zhang, “Modification of polyurethane foam carriers and application in a moving bed biofilm reactor,” Process Biochemistry, vol. 49, 979-1982, 2014. S. Yang, F. Yang, Z. Fu, T. Wang, and R. Lei, “Simultaneous nitrogen and phosphorus removal by a novel sequencing batch moving bed membrane bioreactor for wastewater treatment,” Journal of Hazardous Material, vol.175, pp. 551-557, 2010. F. Kargi, and A. Uygur, “Nutrient loading rate effects on nutrient removal in a five-step sequencing batch reactor,” Process Biochemistry, vol. 39, pp. 507-512. 2003. F. Kargi, and A. Uygur, “Effect of carbon source on biological nutrient removal in a sequencing batch reactor,” Bioresource Technology, vol. 89, 89-93, 2003. APHA, Standard Methods for the Examination of Water and Wastewater, 17th ed. APHA, AWWA, WPCF, American Public Health Association, Washington, DC, 1989. B. Rusten, L.J. Hem, and H. degaard, Nitrogen removal from dilute wastewater in cold climate using moving-bed biofilm reactors, Water Environmental research, vol. 67, pp.65-74, 1995. P. Reboleiro-Rivas, J. Martín-Pascual, B. Juárez-Jiménez, J. M. Poyatos, R. Vílchez-Vargas, S. E. Vlaeminck, B. Rodelas, and J. González-López, “Nitrogen removal in a moving bed membrane bioreactor for municipal sewage treatment: Community differentiation in attached biofilm and suspended biomass,” Chemical Engineering Journal, vol. 277, pp. 209-218, 2015. J.C. Leyva-Diaz, A. Gonzalez-Martinez, J. Gonzalez-Lopez, M. M. Munio, and J. M. Poyatos, “Kinetic modeling and microbiological study of two-step nitrification in a membrane bioreactor and hybrid moving bed biofilm reactor-membrane bioreactor for wastewater treatment,” Chemical Engineering Journal, vol. 259, pp. 692-702, 2015. A. Oehmen, P.C. Lemos, G. Carvalho, Z. Yuan, J. Keller, L.L. Blackall, and M.A.M. Reis, “Review Advances in enhanced biological phosphorus removal: From micro to macro scale”, Water Research, vol. 41, pp. 2271-2300, 2007. W. Cai, B. Zhang, Y. Jin, Z. Lei, C. Feng, D. Ding, W. Hua, N. Chen, and T. Suemura, “Behavior of total phosphorus removal in an intelligent controlled sequencing batch biofilm reactor for municipal wastewater treatment,” Bioresource Technology, vol. 132, pp. 190-196, 2013. ISNAD TUNC, Muslun Sara . "Performance of Nitrogen and Phosphorus Removal of Moving Bed Biofilm Reactor Operated as Sequencing Batch". 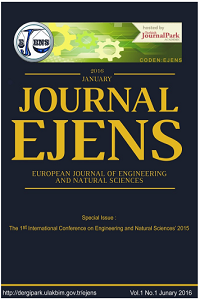 European Journal of Engineering and Natural Sciences 2 / 1 (February 2017): 108-113.